Informtainment.com by ORLANDO: Could Imeem be the best of both worlds? Could Imeem be the best of both worlds? Imeem is a great service for music sharing. The people who are in the know, probably use imeem to share music and create their own play list already. For those who are new to this platform, Imeem has a unique feature which allow users who listen the music uploaded by friends, to purchase song via Itunes or Amazon. This allows Imeem to make money from these two affiliates (Itunes and Amaazon) while providing a service. The user interface is free but to download will cost you! 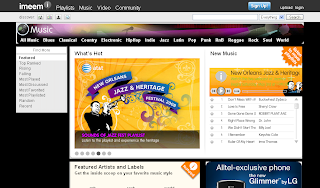 Imeem is also great for posting music to blogs, websites, myspace, and facebook to name a few.